Читал я обсуждения по накручиванию хитрых безумных звуков* (конечно же, там упоминали модулярку, Kurzweil K2xxx, Fizmo, FS1R и прочих завсегдатаев), и впервые для себя услышал про эту "серию" от Ямахи. The Yamaha EX7 and 5 are samplers and multi architecture synths. They can sample (EX7 in Mono and EX5 in stereo) or can load WAV files in from floppy, using a free program soundfonts can be converted, there are good editing and looping features on board, but no loop xfade so you can do that in computer if you need it. I put 16MB old PC simm RAM (£5) in my EX7 (£5) and put a 16meg flash ram board in from sector 101 (£60) in too so I can make an ultimate permanent ROMpler bank. I paid £119 for the EX7 and I'm blown away, looking forward to a programming session tonight. Easily the most interesting thing Yamaha ever did (besides AN1X and fsr1) and an amazing machine. It also wave sequences up to 4 waves by using a delay parameter on the envelopes, and you can do this whilst cross modulating itself. I loaded in a load of kawai K4 and VS waves and got some vector synthesis going too. The UI is pretty easy to get around. Lastly are the effects, which are actually classy and warm. Many insert types include a control delay that you can assign to anything for tape warping stuff, bitcrushers, vinyl simulation, etc. Заглянул еще мануал почитать, про алгоритмы (особенно хваленый самоФМ и торнадо захотелось разузнать; остальные же, вроде, классические вполне). FDSP, or “Formulated Digital Sound Processing,” is actually an adjunct to AWM synthesis. It adds a sophisticated note-dependent effect processor to the basic AWM synthesis system. In contrast to a standard effect stage, the FDSP synthesis stage uses individual note and velocity data to control effect parameters, thus making it possible to simulate the characterics of a number of real-world musical components, as well as produce totally new effects. For example, FDSP can effectively model the frequency and velocity dependent characteristics of electromagnetic guitar or piano pickups, thus adding more realistic response to these types of voices, or adding a whole new dimension to other sounds. It can also alter the delay time of flange or chorus type effects according to the note played, thus producing totally new sounds that are responsive and “alive.” Many other effects are possible. When FDSP or AN+FDSP (EX5/5R) is selected as the Voice Type from the PARAM menu (in COM), FDSP menu is added to the bottom of the screen as the [F5] function. Each of the four AWM elements for the FDSP voice type, and three AWM elements for the AN+FDSP voice type, utilize the FDSP unit in creating a voice. EP Pickup simulates the electromagnetic pickup of an electric piano. The mechanism how the EP Pickup type is formed is as follows: first, the signal sent to the FDSP unit is converted into the vibration of the tine of an electric piano. Next, the vibration is detected by the pickup opposite to the tine. Then the signal detected by the pickup is modified with the frequency characteristics unique to the electromagnetic pickup, and output. This system incorporates Yamaha’s Virtual Acoustic technology. EG Pickup simulates the electromagnetic pickup of an electric guitar: tonal changes due to the picking position and the pickup position, and the characteristics of an electromagnetic pickup. The mechanism how the EG Pickup type is formed is as follows: first, the signal sent to the FDSP unit is converted into the string vibration. Next, the vibration is detected by the pickup. Then the signal detected by the pickup is modified with the frequency characteristics unique to the electromagnetic pickup, and output. This system incorporates Yamaha’s Virtual Acoustic technology. The FDSP unit uses a unique algorithm to change the input signal to the sound of water, an application of the Virtual Analog synthesis. The feeling of running water is created by the Sample & Hold LFO filter modulation that is applied to the input signal. Also passing the signal through the resonating strings corresponding to each pitch gives the feeling of various pitches. PWM is a sort of chorus effect, similar to the pulse width modulation found on an analog synthesizer. Generally, a pulse (square) wave can be obtained by taking the difference between a phase shifted saw-tooth wave and the original wave, and by modulating the delayed phase of the resultant wave using LFO and/or EG. Utilizing this principle, the frequency characteristics similar to a comb (comb filter), the PWM type allows you to simulate the pulse width modulation of VCO. Chorus effects similar to the conventional pulse width modulation can be added, since this program decrease specific harmonics on any type of the input signal. The LFO can be set for each individual note or for all notes at one time, while EG can be set for each individual note. Flange lets you get the flanging effect for each note. The original input signals and the delayed signals are mixed together to produce dips and their feedbacks produce peaks, to create a unique comb filter, accordingly. The frequencies of the dips and peaks can be changed by modulating the delay length using LFO and/or EG. The LFO is set for all notes at one time while the EG can be set for each individual note. Phaser lets you get phasing effect for each note. 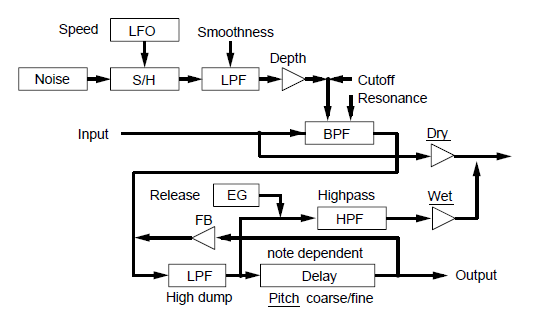 The original input signals and the shifted phase signals obtained by passing an all pass filter are mixed together to produce dips and their feedbacks of the repeated delay produce peaks. The frequencies of the dips and peaks can be changed by modulating the factor of the all pass filter using LFO and/or EG. This allows you to get special effects by synchronizing the phase-shift to the pitch frequencies correctly. The LFO is set for all notes at one time while the EG can be set for each individual note. Self FM lets you add extra richer harmonics to the sounds. The mechanism how the Self FM type is formed is as follows: first, input signals are sent to the delay unit. Next, the phases of each signal sent from the delay unit are modulated (phase/frequency) by the input signals themselves, to cause the waves distorted. Consequently, extra harmonics are obtained. Tornado is a kind of FM synthesis operator with the carrier frequency “0,” using input signal as a modulator. The input signal is modified by the LPF and the special limiter, to form an appropriate modulator waveform, and the modulator waveform looks up the sine wave. The greater the modulation intensity, the greater the change of the phase to be looked up becomes, to emphasize the higher frequency range. As the modulation intensity decreases so does the harmonic content. The feedback for the FM (“Edge Bias” parameter, below) is available to get sounds with both true sine wave and rich harmonic contents of the saw-tooth wave. sine wave as the modulation wave, the Ring Mod provides with more complicated harmonics because two AM modulators (main and sub) can be used. The Seismic, as its name implies, makes the sounds roar. The input signal is sent to the time-variant lowboost filter, then passed through the overdrive. Since the low-boost amount can be controlled by the EG, Seismic will not only emphasize the bottom of the sounds but provide with a compressor type effect. Also, since the overdrive is effective for each note, different from a conventional effector, Seismic can offer you a new dimension to your sounds. Думал, хотя бы k4d4wr поделится соображениями. И был кто-то на форуме с младшей моделью, правда теперь неактивный юзер вроде. Но вот насколько удобен и юзабелен интерфейс?